One of the benefits of working at the the Intel Experience Store was an excuse to play with an Intel Galileo Board. As a happy little AVR based Arduino programmer, the Galileo is not something I would have checked out otherwise. I’m glad to of had the opportunity because this project opened my eyes to the power of combining Python with low level I/O in way that I knew about but hadn’t really been attending to. Starting from an article on SparkFun I combined pagermotors, springs, paper and a VCR case into a derivative of Tom Igoe’s classic email clock. In this example the pager motor bees shake with more and more agitation the more unread email in the inbox. The code I used is already in a GitHub repository called BeeMail. I’ll be adding the schematics there as I finish the write up. 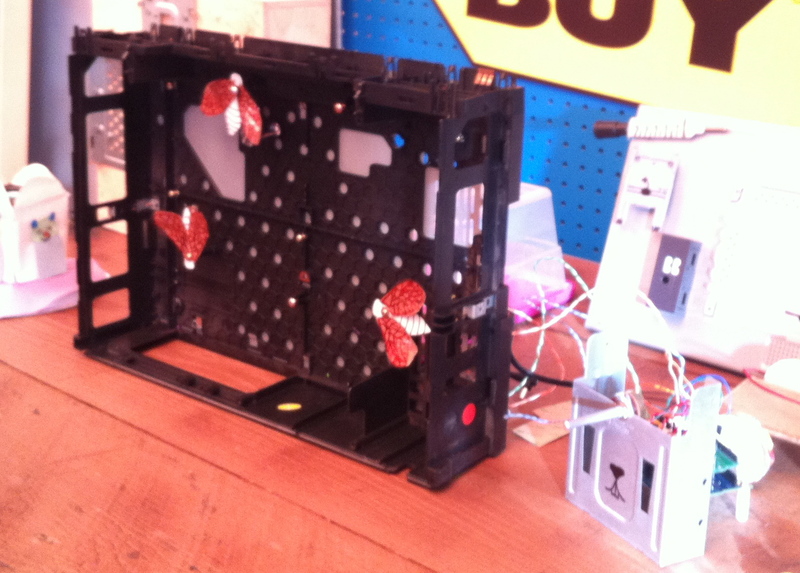 The project requires motor circuitry, wifi, an Arduino sketch and Python all to work together. 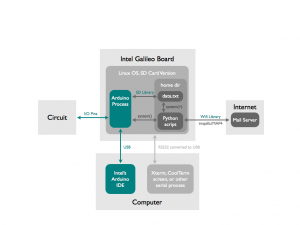 The Galileo board is a welcome freshman effort for Intel into the EZ-Maker-Friendly-Protoboard community. The Galileo is Arduino Certified, but not the right choice for a first dip into the Arduino ecosystem. Those already attached to working with the powerful x86 architecture or experienced Arduino users interested in a change will be the most comfortable with Intel’s design decisions. I’ve been struck by the fact that many things listed as optional in the official documentation simply aren’t that optional. Many of these represent simple fixes that I suspect Intel will change in the next revisions as Intel seems to be soliciting feedback from all the right people. In the mean time, here are my fair warnings of things to have before getting started to minimize frustration down the line. A properly formatted SD card is not “optional.” The Galileo board does not remember a sketch once you unplug it without one. AND enough comfort level in command line to fix the MacOS IDE by adding missing sym links. I don’t know if the same error is present in the Linux IDE. If you do any serial communication with the board from within a sketch there needs to be a 3 to 5 second delay in the setup() loop or there will be serious trouble loading new programs onto the board. A wifi card like Intel Centrino® Advanced-N 6205 or the N135 work with the firmware of of the box but Sergey Kiselev shows how to update firmware for others like the Intel Centrino® Advanced-N 6235 802.11n. There is more information in the forums. Stand-offs and Screws so you aren’t scrapping the card against the ground since the mini-PCI socket lives on the bottom of the board. Not necessary, but handy: a protoshield with mini-breadboard. If not those than the standard a breadboard will do and of course any other components need for your given project. UPDATE: Forgot to add that I/O pins are pulled HIGH between embedded Linux startup and sketch start up so use negative logic as much as possible. 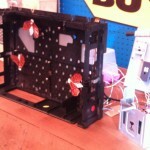 This project required me to use a lot of accumulated troubleshooting skills. Over the next week or so I’ll be going through not just what someone else can do that will work, but how I figured out what to do.